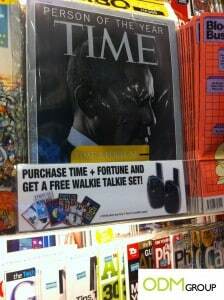 Time and Fortune Magazine is giving away a free walkie talkie as its gift with purchase for every purchase of both magazines. The walkie talkie is a great communication tool. It allows between two parties at two different locations within close vicinity. Time is an American weekly news magazine and Fortune is a global business magazine published by Time Inc. The publishing business, consisting of Time, Life, Fortune, and Sports Illustrated, grew to become Time Warner. In turn, AOL grew as it acquired Time Warner in 2000 when Time Warner was the world’s largest media conglomerate. Fortune’s primary competitors in the national business magazine category are Forbes, which is also published bi-weekly, and Bloomberg Businessweek. How may the walkie talkie be used as a gift with purchase? The walkie talkie may be used for voice communication between two parties who are situated at two locations within a close distance. This will allow one person to convey a message conveniently to another person at a site. It is especially useful for events whereby both people can easily communicate with each other without having to call each other on mobile phones. Thus, it makes a great gift purchase for readers and attracts more customers to buy the magazines. How may the walkie talkie affect sales? Readers will be encouraged to buy both Time and Fortune magazine instead of just one of them in order to get the walkie talkie gift with purchase for free. This will increase sales. Moreover, the walkie talkie may be branded with the Time logo in order to increase brand awareness. This will facilitate free advertising and more people will know about Time and Fortune magazine. The logo will also increase brand recall. This will enforce brand loyalty as more people will remember about the magazine and they will make repeat purchases. Hence, this will increase sales for Time Magazine.